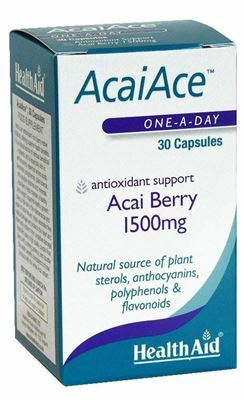 Healthaid HEALTHAID ACAI ACE (ACAI BERRY 1500MG) Product #: 5.0 stars based on 6 reviews 5.0 1.0 SOM Price: Rs.1507.50 Rs.1507.50	Available from: SAVEONMEDICALS.COM In stock! Order now! AcaiAce Capsules contain Acai Berry, which is an antioxidant-rich berry native to Brazil and offering natural health benefits. It is a natural source of various beneficial nutrients and is especially rich in anthocyanins, essential amino acids, flavonoids, polyphenols, plant sterols, and valuable vitamins and minerals. Acai Berry helps maintain a healthy body weight, supports healthy growth, plays a vital role in the maintenance Importantly it helps repair of body tissues by neutralising free radical damage. Therfore it protects the heart and other body systems from oxidative damage. HealthAid uses a high quality purple Acai Berry, with a strong potency, and double the health benefits compared to those products with the white Acai variants. What is the frequency of use of HEALTHAID ACAI ACE (ACAI BERRY 1500MG)? Have you been prescribed HEALTHAID ACAI ACE (ACAI BERRY 1500MG) by a doctor? How do you rate HEALTHAID ACAI ACE (ACAI BERRY 1500MG) on price? This page was last updated on 19-09-2018. Q1) Is HEALTHAID ACAI ACE (ACAI BERRY 1500MG) effective? Q2) What is the frequency of use of HEALTHAID ACAI ACE (ACAI BERRY 1500MG)? Q3) Have you been prescribed HEALTHAID ACAI ACE (ACAI BERRY 1500MG) by a doctor? Q4) How do you rate HEALTHAID ACAI ACE (ACAI BERRY 1500MG) on price? Q5) What is your overall rating of HEALTHAID ACAI ACE (ACAI BERRY 1500MG)? Is HEALTHAID ACAI ACE (ACAI BERRY 1500MG) effective?